Всем привет. С вами Светлана. Welcome to RussianPod101.com , Русский язык за три минуты. 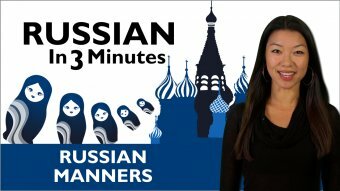 The fastest, easiest, and most fun way to learn Russian. In the last lesson, we learned how to introduce ourselves in Russian. Today we’re going to learn how to thank people politely. Готовы? Are you ready? Поехали! Then let's start! Большое means "Big". In context, Большое спасибо literally means "Big thanks." So, when someone thanks you, how should you answer? There are several ways to respond. One, which is fairly close in translation to the English phrase "You're welcome", is “Пожалуйста”. It is very common in Russian, but we also quite often use another phrase: “Не за что,” which means “not at all”. In English it sounds a little bit strange to say “please” when somebody thanks you, right? But in Russian, by using this word you are saying that you are “pleased” to have been helpful. Now it's time for Svetlana’s tips. When saying “thank you,” in Russia, body language is very important. Спасибо is a universal word and can be used in both formal and informal cases. You can make it sound more formal just by changing your intonation. Спасибо! Friends usually act more openly and even slap each other on the shoulder. In any case, it is very important that your thanks be accompanied with a smile and, again, direct eye contact. Good job. That’s it for this lesson. By the way, do you know what До свидания means? In our next lesson you'll learn this and more other greetings in Russian. When I listen to the pronounciation of the sentence Не за что, I hear the last letter as an "a", but when I listen to it at half speed, it sounds mor like an"o". Why the difference? and which one is correct? Thank you for your help. Your courses are great and help a lot more than just using a text book. Thank you for your positive feedback on the video lesson! Please let us know in case you have any doubts. I am enjoying your videos of the Russian language. I am taking Russian at college to meet my degree requirement. My grandmother was Russian and she knew the language and never taught us. I am very excited to learn, as I have been studying for many years in my leisure time. However, it can be overwhelming when in the classroom. Russian Pod 101 is a nice addition to the class. How about starting from Ultimate pronunciation guide, Alphabet, and all our series for absolute beginner? We hope you liked this lesson too. How much time i need to start speaking the language ? ?